A sort-of escargot-meets-"Cars" adventure, it has some sharp vocal turns and remains fun even when its inventiveness runs out of gas. Turbo won't set the world of animation on fire, but it's a fun movie. Ultimately, "Turbo" nicely lives up to its diminutive hero's credo of, "No dream is too big, and no dreamer too small" - a pleasant thought, for people of all sizes. DreamWorks' 3-D confection ... featuring Ryan Reynolds as a garden-trolling slowpoke who dreams of Indianapolis 500 glory. Turbo's colourful trek to product placement-littered Indianapolis is as rote as it gets, but little viewers won't care about predictability. Honestly, they pretty much had me at "racing snails." Great voice talent in a story that puts the "go" in escargot. Has some appealing characters, a few laughs and then devolves into a predictable Tortoise and the Hare spinoff. "Turbo" has just enough heart to make it to the winner's circle. An easy recommendation, well-considered and well-executed, a treat for anyone who likes comedy or ambitious takes on make-believe worlds. 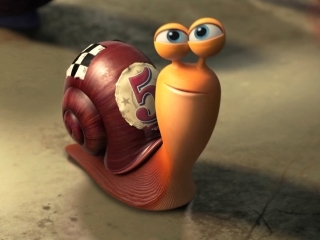 A fresh, fast and funny little fable about a freakishly fast garden snail who tries to enter the Indy 500. There's certainly no harm in seeing "Turbo." Competent, pretty funny in places, awfully nice to look at, that sort of thing. All Turbo does is give Reynolds, Paul Giamatti, Samuel L. Jackson and Snoop Dogg the easiest paychecks they'll ever make, and its corporate overlords the chance to sell a few toys. For all its chronic familiarity, the movie has its minor pleasures, many of them visual. Though at this point it's basically a given that a new studio-animated movie will look good, Turbo often looks downright exceptional. While there's no denying that the film is a harmless, wholesome, and heart-warming ride crafted with polish and skill, it's also so predictable that you'll see every twist in the story driving down Fifth Avenue. Co-writer/director David Soren's story offers little that even the average 6-year-old couldn't imagine, though the film's considerable charm comes through via its characters and sense of humor.